The Student Agency Improvement Community (SAIC) was a networked improvement community dedicated to equipping students to persist in the face of rigorous learning challenges. SAIC brought academic research on the psycho-social factors that affect learning together with the discipline of improvement science methods to design classroom experiences that have value to students, promote academic mindsets, build a sense of belonging, and support students in developing the learning strategies they need to succeed. The organizations in SAIC included Summit Public Schools, Eskolta and the New York City Department of Education, James Madison University and Harrisonburg (VA) City Schools, Schools That Lead and Milford and Christina School Districts in Delaware, Carnegie’s Productive Persistence Network in postsecondary settings, and High Tech High in San Diego. The Carnegie Foundation served as the “central hub” for this improvement community by providing a common theoretical framework and measures, as well as analytics and network support. Carnegie also supported the integration of improvement science into this project. Carnegie ensured that recent academic knowledge was accessible to the improvement community and that the improvements developed within SAIC were consistent with the latest, most rigorous scholarly research. 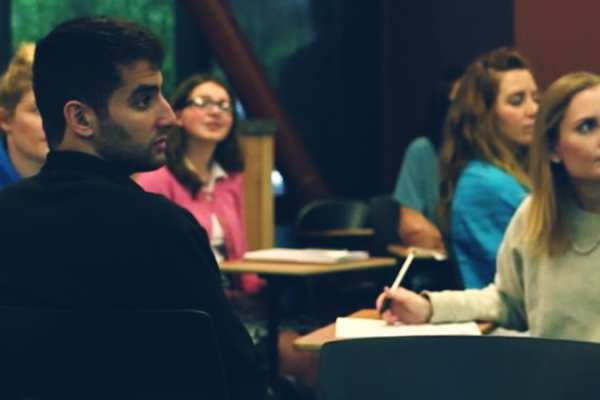 SAIC directly partnered with scholars in the Mindset Scholars Network, an interdisciplinary research network based at Stanford’s Center for Advanced Studies in the Behavioral Sciences to shorten the lag time between disciplinary insight and the use of promising findings in classrooms and schools. 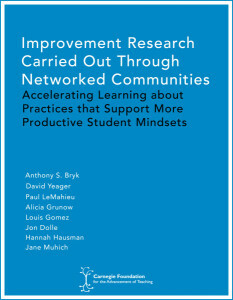 Each of the six SAIC networks identified a high-leverage problem of practice, set an aim, developed a theory of practice improvement, identified network members to engage in the improvement work, tested change ideas specific to student agency, and analyzed data specific to the problem they were trying to solve. Across the networks, SAIC included 98 schools and 532 teachers, and impacted over 19,000 students. The central hub at Carnegie worked closely with each network to provide individualized coaching and expertise on improvement science, relevant psychological theory, measurement for improvement, and network science methodologies. This included a series of weekly calls, two on-site visits, a workshop at the Carnegie Foundation Summit on Improvement in Education, and access to all the change ideas, measures, tools, and resources on the website and the Networked Improvement Learning and Support (NILS) platform. The central team also led additional, targeted coaching sessions, particularly around measurement for improvement and psychological content, for each of the networks. The Summit Public Schools network worked within nine schools in California to address the performance gap between English learners and non-English learners. Originally, the aim of their network was to have 100% of Summit students on a trajectory toward college readiness by June 2017. An in-depth review of their data in spring of 2016 (involving the Carnegie hub, the Summit hub, and their teachers) revealed that English learners were not consistently on a trajectory for college readiness and that there was a performance gap between English learners and non-English learners as measured by the number of completed assessments across all content areas on the Summit Learning Platform. Across their nine schools, English learners comprised 12% of the student population, and evidence of a performance gap could be seen when these students entered Summit schools in grades 6, 7, and 9. The data analysis also revealed significant negative differences between English learners and non-English learners on survey items of growth mindset and academic belonging (10-20% differences). Summit Public Schools is continuing their work as a networked improvement community in 2018. The team is actively spreading and scaling their package of activities and routines designed to promote language skills and learning mindsets for English learners. Additionally, they are broadening their focus and their aim is to help all of their students succeed in English and mathematics. To support their network, they have created three full-time site-based research manager positions that, in part, support continuous improvement projects at the site level and help to bridge theory and practice. The network in New York City consisted of nine schools that were united in their aim to increase the number of students who graduate high school with the skills needed to succeed in college. GraduateNYC found that only 47% of students in New York public schools were “college ready” in 2014, measured by standardized test performance (e.g., 20 or above on the ACT English test, 21 or above on the ACT Math test). Within the nine schools that Eskolta partnered with, they observed that the percent of college ready students was 40% and they set an aim to increase the number of students showing college readiness to 50% by June 2017. A team of three to five educators from each of the nine schools participated in five networked improvement community meetings, received coaching support onsite and off from Eskolta partners, and attended site visits at each other’s participating schools. All schools started by testing an introductory growth mindset activity. Then, each school team engaged in a focused period of data analysis and user interviews to better understand their contexts, and followed this with an action period where they tested relevant SAIC change ideas. Across the nine schools, the teachers tested 15 different change ideas, and several of these practices produced standout results in shifting students’ mindsets and learning outcomes, including a routine to improve peer-to-peer feedback, the revising work and tests routine, the challenge problems activity, and a one-on-one conferencing protocol. The network in New York moved the needle on its aim and observed that 54% of their students demonstrated college readiness, an increase from 40%. For students who started with low or mixed levels of student agency, they saw gains in their beliefs about growth mindset, value, and sense of belonging. This year, the New York network has expanded their networked improvement community to include 12 schools, with an explicit focus on the schoolwide culture that promotes learning mindsets and skills, and with a goal to better foster students’ sense of belonging and value for learning. They plan to continue their network meetings, cross-site visits, and coaching supports while also including more on-site coaching, more professional development on belonging and value, and better training for their team leaders. Baseline data from the student agency survey in September pointed to student voice and choice as a high-priority area for growth, so the team at Eskolta is bringing in a coach for their January convening to support schools as they develop new change ideas. For the spring, the schools will reflect on what they’ve learned so far and plan for which direction each school will take: continuing the change ideas they developed in the fall, building out tools/routines to support those change ideas, or building on their deeper understanding of the problem in order to redirect their energy toward additional change ideas. In Harrisonburg, the team at Thomas Harrison Middle School focused on improving state achievement test pass rates in English and Math to 80% by the end of June 2017. Prior to joining SAIC in 2014, the pass rates on the state achievement tests were 62% and 60%, for English and Math respectively. Due to these low pass rates, Thomas Harrison Middle School did not meet full accreditation standards and was put on a three-year watch list by the state. Also, notable for Harrisonburg is that they are a refugee resettlement city, so they have a unique school population where over 70% of students receive free and reduced-price lunch and over 40% of students are English language learners. Over the last three years, the Harrisonburg network has expanded its improvement efforts from a team of six teachers in one school to a total of 44 teachers and five administrators across three schools. This year, Thomas Harrison Middle School had pass rates on state tests for English and Math that were 73% and 76% respectively, and they have seen a significant increase in students’ adoption of a growth mindset in mathematics on the SAIC student lens survey. Thomas Harrison Middle School received notice that they were fully accredited at the end of the 2017 school year. The principal, Don Vale, attributed this achievement in large part to the efforts of the teachers and researchers involved in SAIC. Their team’s iterative testing and refinement of their introductory growth mindset tablet application has been a key component of their success (see Barron, Hulleman, Inouye, & Hartka, 2015 for more details) as well as their teachers’ development and reliable use of effective classroom routines that promote a mastery orientation, provide opportunities to learn from mistakes, and allow for students to reflect on how the current course material relates to their short-term and long-term goals. The Harrisonburg network continues to spread and scale their improvement work. In Fall 2017 at Thomas Harrison, all teachers and staff (over 60 in number) have employed at least one change idea to promote student agency. The school fully adopted the “Starting Strong and Staying Strong” language of the Productive Persistence Network to create different change menus to promote student agency at different points throughout the school year. They also added new language for a Finishing Strong package to develop unique change ideas on how to promote Student Agency at the end of the school year, especially during statewide testing in the final month. To develop, test, and spread ideas for their Starting, Staying, and Finishing Strong packages, they created new improvement meeting routines and norms embedded within the teachers’ regular school meeting and committee work, including the formation of a school-wide student agency improvement committee, with multiple representatives from each grade and a lead improvement teacher for each grade. For example, for the first time in the beginning of the 2017–2018 school year, all students at each sixth-, seventh-, and eighth-grade level received a unique Starting Strong growth mindset intervention within in the first month of school and each grade received a unique Staying Strong three-week growth mindset intervention during a school-wide socioemotional learning unit. The work started at Thomas Harrison Middle School is now being shared with the district’s other middle school, Skyline Middle School, and Skyline is starting their own improvement work and sharing successes back to Thomas Harrison. Schools That Lead has been working with two middle schools in two districts: Milford Central Academy and Shue-Medill Middle School. In their causal system analysis, the team learned that every year between 16 and 20% of their students were being held back or retained in ninth grade. Working together, both schools set an aim to halve their retention rates by June 2017. With the coaching support of Schools That Lead, the two teams of principals and teachers worked across middle schools to test ideas to improve student agency and to learn from one another. As they learned more about their system and the reasons underlying the problem, the team was able to create a watchlist of students at risk of being retained. Students were added to the watchlist based on the following criteria: 64% or lower in Math, English Language Arts, Social Studies, or Science, five or more unexcused absences, or five or more in-school or out-of-school suspensions. Unlike in previous years, in which these data were provided to the principals only at the end of the year, the team analyzed this data in every quarter and adjusted their improvement testing strategy to help the students who were most at risk for being retained. As a result of their improvement work, Milford Central Academy and Shue-Medill Middle School both successfully reduced the number of students held back in 2016–2017. Milford Central Academy observed that 10.6% of ninth-grade students were held back at the end of 2017 (compared to 16.7% at the end of 2016) and Shue-Medill Middle School observed that 14.7% of ninth-grade students were held back at the end of 2017 (compared to 20% at the end of 2016). The team employed several routines and activities to promote student agency and achieve their aim, including the revising work and tests routine, the everyday growth mindset language routine, the introductory growth mindset activity, the challenge problems activity, the daily mindfulness routine, and the stress reappraisal activity. These change ideas are all included in the final SAIC change menu. The principals, teachers, and Schools That Lead team have continued to push their improvement work forward by supporting more teachers to join the community. The principals have developed additional professional support opportunities and have created an accessible resource bank with change idea materials and practical data tools. Schools That Lead continue to refine their Teacher and Principal Leadership Initiatives to incorporate the lessons they have learned from the past three years, including being clearer about the development of an aim statement and theory of action, acknowledging the need to make room to do the improvement work, explicitly examining culture, paying attention to student feedback, starting small and moving slow, collecting and analyzing evidence to build warrant, and actively sharing the work—specifically the processes, results, and what worked and what did not work. The Productive Persistence Network at Carnegie continues to work on student motivation and learning strategies as part of a nationwide effort to improve success rates in developmental mathematics across the 70+ community colleges that are a part of the Carnegie Math Pathways Network. For students who need to take one or more developmental mathematics classes before being allowed to accrue college credit, the two-year success rate is only 15%. In this sense, mathematics becomes a gatekeeper rather than a gateway for nearly 500,000 students a year. In 2010, the Carnegie Foundation and the Dana Center worked together to change the system and produce better outcomes for students in developmental mathematics, and this resulted in two accelerated courses—Statway® and Quantway®—that incorporated relevant content, innovative pedagogy, targeted supports, and interventions of students’ learning mindsets and skills. Looking at the data from this past year, the pass rate was an average of 68% in Statway and Quantway—more than quadruple the pass rates in traditional developmental mathematics classrooms. Currently, 10,000 students are enrolled in these mathematical pathways each year. Despite these promising results, the team was seeing substantial variation in success rates across the network and decided to better understand what works for whom and under what conditions. After conducting in-depth analyses looking at variation across classrooms and colleges, the team discovered that one area to focus on was maintaining students’ mindsets and skills throughout the term. The Starting Strong package, a suite of 10 activities and routines designed to create a learning environment that fosters students’ beliefs about themselves as mathematical learners and doers, has had significant impact in the first month of the course on students’ growth mindset, academic belonging, and belief that mathematics has value. However, the impact of these interventions fades as students continue throughout the course. To address this, the improvement team and faculty leaders in the networked improvement community joined SAIC in 2014 and launched an initiative called Staying Strong to sustain students’ mindsets and skills throughout the term. The team has developed a new set of effective routines and activities that have been repeatedly tested and refined in more than 50 classrooms. The first routines to be codified were routines to reduce doubts about belonging, and these student- and faculty-led noticing routines have produced median attendance rates of 93% in classes where they are used consistently. The next set of activities and routines have focused on improving students’ learning skills, ranging from activities to reduce anxiety (i.e., stress reappraisal activity) to everyday routines to promote metacognition (i.e., intro tickets and learning strategies discussions). Compared to the average pass rate of 68% in the Carnegie Math Pathways network, the pass rate within our Staying Strong team was 79% in 2016–2017. The Productive Persistence Network is continuing their improvement work and spreading and scaling the set of Staying Strong routines and practices to the 300 faculty members in the nationwide network. The improvement team is also expanding to include new member organizations from high schools and tribal colleges and universities, and seeks to better understand what works for whom and under what conditions. The network organized by High Tech High relaunched in the fall of 2016 with a focus on improving math agency in their elementary, middle, and high school mathematics courses. This network, called the Mathematical Agency Improvement Community, involved 60 teachers from 19 schools. Their aim is to improve the number of traditionally underserved students demonstrating mathematical agency and success to 80%. Progress toward the aim is measured by student outcomes and a pre- and post-survey on student agency that included questions from the SAIC student lens survey and the SAIC learning context survey. Site leaders held two multi-day network meetings to learn from data, consolidate learning about change ideas, and plan for testing cycles. Teachers worked in small groups to test and document their learning. Preliminary analyses from the elementary school mathematics classrooms show improved California Assessment of Student Performance and Progress outcomes and a significant closing of the achievement gap between students eligible for free and reduced-price lunch (FRL) and those students not eligible for FRL. In these classrooms, teachers are using cognitively guided instruction with Common Core-aligned curriculum, and have been testing a Launch, Explore, Discourse lesson structure to promote equitable learning environments. Teachers in their networks have also tested introductory growth mindset lessons and routines to promote belonging and effective group skills during mathematical discussions. High Tech High continues their work on student agency in mathematics through their Mathematical Agency Improvement Community. The network is currently testing a whole-class discourse facilitation change idea designed to help students engage in collective sense-making in mathematics. This year, 38 teachers from 17 schools are participating and over 2,000 students are being impacted by the network’s improvement efforts. Students are currently being asked to engage in more complex subject matter than ever before. Under these more challenging expectations, many students will struggle and question their ability to succeed. Inevitably, many will fail. Absent deliberate attention to the psycho-social factors necessary to foster deeper learning, the new academic regime will fail far too many students, particularly those who are already struggling. Fostering more adaptive mindsets will kickstart self-reinforcing cycles of increased motivation, improved academic behaviors, increased and more sustained effort, and better performance that enable students to be ongoing agents in transforming their academic trajectory. Student agency is malleable and responsive to light-touch, low-cost interventions. These approaches seem to have the greatest benefit for students who have a history of low performance and those who are members of groups that are negatively stereotyped. Several important barriers stand in the way of harnessing promising social-psychology findings into reliable educational practices. Practitioners are disconnected from the research literature and unable to translate these insights into educational routines. Researchers are disconnected from classrooms and have not established methods to contextualize psychological approaches to classroom. In response to these challenges, Carnegie brought together researchers and practitioners in networked improvement communities to build the interventions, tools, measures, and practices necessary to reliably develop students’ academic mindsets and learning strategies in classrooms at scale. Bridging this gap not only requires researchers and practitioners to come together–it also requires a method of translation. Improvement science offers a discipline for evidence-based adaptive integration of best practices into a local context. 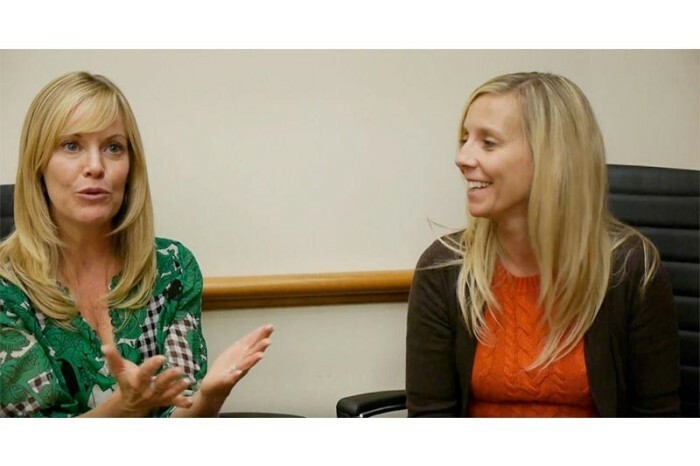 In this interview, two principals discuss the benefits of working in the SAIC network. They note the value in collaborating with other network members and using improvement science to identify and test effective strategies that can be spread with confidence. 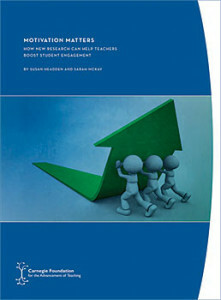 This report summarizes new psychological and behavioral research around building motivation and shows how teachers can increase motivation by encouraging positive behaviors, improving their academic mindsets, and enhancing their sense of connectedness. A white paper prepared for the White House meeting on "Excellence in Education: The Importance of Academic Mindsets" focused on ensuring the ideas presented at the meeting could achieve effectiveness with reliability at scale. In designing two alternative mathematics pathways for students taking college developmental math classes, Carnegie has acknowledged student baggage as one of the key drivers that must be addressed to fully support student success. Carnegie's report on how the productive persistence strategy within the Community College Pathways has resulted in positive changes in student engagement and outcomes to addressing the alarming failure rates of students in developmental mathematics. Lawrence Morales and Jane Muhich at Seattle Central College speak about helping students succeed by focusing on developing productive persistence, which is the tenacity and good strategies students need to be academically successful.